When I first proposed the idea of participating on the ASB Berlin trip to my family and friends, many people's instinctual responses were "Why would you want to go to Germany? Why doesn’t Chabad sponsor an outreach program to Israel?" Before the trip, I really wasn't sure why a Jewish individual would want to visit Germany, let alone live in the country that once tried to destroy us. When someone asked me why Berlin was the location chosen, I responded with the information that Rabbi had engrained in my head: “Berlin has one of the fastest growing Jewish populations in the world and is home to a flourishing Jewish community.” Although I had that fact down, I still didn't truly understand people’s gut wrenching negative reactions in regards to my upcoming trip and in regards to fellow Jews choosing Berlin as a place to live. I also was unsure how people in Germany would react to a group of 18 American Jewish college students standing tall, walking together through the Berlin streets. When we got off of the plane in Berlin, Rabbi immediately led the group in song, singing "Am Yisrael Chai," and dancing in the Berlin airport. Some of the students joined in on the excitement, but many of us were passive observers, contemplating the reactions of the German community to our outright demonstration of Judaism in the airport and uncomfortable speaking Hebrew in Germany. But, by the end of the week, we were a group of 20 proud Jewish Americans chanting "Am Yirael Chai" and publicly demonstrating immense Jewish pride in the country with such a dark history. We sang "Am Yisrael Chai" at the Wannsee Conference where Hitler made plans on how to implement the Final Solution. We sang "Am Yirael Chai" and danced at a Jewish day school with young Jewish German students, a school that was once a center for the Hitler Youth Training. We sang "Am Yisrael Chai" at Hitler's death bunker. ASB Berlin taught me what it means to be resilient...what it means to “fight” for life….and the importance of carrying my Jewish heritage forward. Hitler's Final Solution was to exterminate the Jews and have a museum glorifying the extinction of the Jewish people. The Nazi's told the world that the Jewish people did not deserve to live. So, this week, we stood together as proud Jewish Americans, brought Jewish pride across the world, and were part of the revival of Judaism in Germany. As I sit on the plane back to Chicago right now, I am feeling so many emotions because this trip has so deeply impacted me on many levels. And now, I DO have an answer to the “why Berlin” question. Judaism must thrive in Germany because it is a place where the Nazis tried to exterminate an entire religion there, OUR religion, 75 years ago. THEY are not there any more; but WE survived and live. I went to Berlin to further connect to my Jewish heritage and to stand with pride in the country that once said that I do not deserve to be alive. I found the German people to be incredibly likeable and well-mannered. Each morning me, Matt, and Taylor would take a trip to a local coffee shop and have an early breakfast. The attendants behind the counter were more than friendly and enjoyed seeing us each day. It was obvious to them that we were American and they had no qualms with our blatant inability to understand any words that came out of their mouths. Our amusing transactions were shared over laughs and provided a nice underscore to the evident language barrier. Other examples of this German hospitality include: uber drivers who provided their local recommendations, street strangers we had lengthy conversations with, governmental figureheads we questioned, and the unbelievable and exceptionally talented tour guides we had at literally every stop. To say the Jewish connection to the city of Berlin is complicated would be a gross understatement. There was no shortage of somber sights at the tracks of Gleis 17, the various Jewish cemeteries, and the city of Theresenstadt. As we toured the city we uncovered more and more of the fascist architecture that Nazi Germany had left behind. But seeing Berlin's ugly past made it increasingly important that we start looking toward the future. And today I can proudly say that the future of Berlin's Jewish community looks very bright. After visiting the Jewish day school held in an old Nazi building and the beautiful Chabad it became clear that Jewish life in Berlin is beginning to flourish again. Prague is such a great city! I was amazed by the stunning views from each and every vantage point and also pleasantly surprised with the amount of early Jewish history founded in the area. We visited several amazing synagogues and even saw where the Magen David originated from. From there we covered the city head to toe and of course visited (my favorite) the famous Astronomical clock in the downtown square. I was so glad we took the time to travel to the Czech capital and enjoy some downtime with friends in one of the most elegant cities in the world. Overall, the trip was truly a once in a lifetime experience that provided incredible insight into the history of Berlin as well as great confidence in the direction that the Jewish life of the country is heading in. 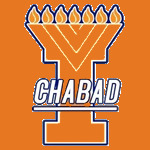 Thank you to Rabbi and Illini Chabad for all of your hard work and putting this exceptional journey together! We are grateful for your infinite energy and contagious spirit! L'chaim! Every day presented me with more information than I could possibly consolidate and decompress before I was up at 7:30 again ready for the next. We learned about Germany's history, Judaism's history, Germany's present and Judaism's present within Germany. We spent hours with Rabbi Yehuda Tiechtel, the man who, with the help of many others just as dedicated as he, brought Judaism back to Berlin. We saw the true spirit of Jewish life there: Family, love, positivity, ENERGY, remembrance of the past, celebration of the present and the future, and above all, fierce pride in being a Jew in the very land where the Jewish extinction was attempted. We learned the history of the effort, sitting at the table of the Wannsee conference, driving past the building where Hitler gave his speeches and walking the crumbled roads of Theresenstadt. At the end of the week, we vigorously rejoiced in our Judaism. For 24 hours we ate, drank, prayed, danced, sang and jumped up and down celebrating Shabbat in Berlin. This trip was a blur, and if you asked me to tell you what my favorite activity was I couldn't tell you. All I can say is that my favorite part of ASB Berlin was seeing firsthand how much love and positivity is present in the Jewish community here, and how I came from half way around the world to fit in so perfectly, so quickly. We started out our Shabbat morning by walking over to Chabad to go to services. However, this service was particularly special because we got to help a boy celebrate his bar mitzvah with the community. This only allowed us to confirm the idea of how proud Jewish people are in Berlin. We ended with a kiddush at Chabad and then walked over to the Rabbi's brother's house. The girls left first so we got to meet with the Rebetzin before everyone came.The second we walked in, I immediately felt welcomed and was so happy to be in a family environment for shabbos. We enjoyed a very large four course meal with too many options to count! Not only was I sitting in a beautiful house eating a ton of delicious food, but I was able to spend time with a group of students I have been connecting with the entire week. This gave us time to reflect on our past week and give us time to relax after everything we have done. By the end of the meal, everyone was so full, but we had fun! We were all talking, playing games together, and didn't need a cell phone or anything else to keep us busy during this shabbat. It was a very genuine and positive experience for me. I know that if I was ever to come back to Berlin, that I would have a family and home that would welcome me in anytime. After a long night in Prague, we started off the day on a more relaxing but meaningful note. Earlier in the week we made packaged Shabbat bags for those in need in the Jewish community. This morning we passed out the Shabbat bags. This was very rewarding because even though there was a language barrier between us and the natives, we still had the common connection of being Jewish and preparing for the Sabbath. Being able to give back to the community was a great way for Sarah to segway into a discussion about mikvahs and she also gave us a tour of the mikvah at the Berlin Chabad this morning. Some women think a mikvah is a large pool you could swim in but actually the mikvah is much like a spa experience. Women are allowed to keep a small bag of their belongings like shampoo, flip flops, etc. or they can come to the mikvah and everything needed to cleanse themselves will be provided to them. Women must wait 7 days after they menstruate to enter the mikvah, in order to ensure that they are truly clean. Mikvahs can also be used as a method in marriages and has helped married couples become more intimate again. A mikvah is a personal experience for the woman to purify herself. Before entering a mikvah a woman needs to be pure in a physically clean sense. In addition, a woman usually gives tzidakah (charity) before entering the mikvah in order to begin her journey to purity with something positive. Entering the mikvah is about the rebirth of their physical and spiritual self. Mikvahs are especially important to women in Judiasm because it is one of the three tasks that only women are allowed to do, among that being challah and lighting candles. Because these tasks are only for women, it allows us to connect more to G-D as Jews. It was a delightful experience to tour the mikvah and in the future, when we are married, maybe we will get to experience this spiritual journey like so many women before us. Friday night started with all the women in our group lighting candles outside the synagogue in Chabad. We learned from Sarah that the lighting of the candles is a mitzvah that only women have the privilege of taking part in. After lighting the candles, the women and men of the group went to their designated areas of the synagogue to witness the end of the bat mitzvah happening that night. Everyone threw candy at the bat mitzvah girl, which I thought was so fun and celebratory; my synagogue at home doesn't do that. After the bat mitzvah service was over, we all walked over to the center for Jewish students in Berlin where we had our own Shabbat service. Joining us were the Rabbi and Rebbetzin from Tel Aviv Israel who had just recently moved to Berlin and a few Jewish students from the area.
. Once the service was over, we had a wonderful dinner with tons of food and drinks. Each person went around and introduced themselves and said what app they would be if they had to pick one. The dinner went on for a long time and during this time, we all got to know each other a little better and really got to be ourselves. There were lots and lots and lots of L'Chaims and some really great and thoughtful speeches from everyone there, which made us all feel very connected and close. This night started off as very overwhelming for me because I sometimes feel lost in large groups, but by the end of the night I honestly felt like I could go talk to anyone at the table and the group felt so much smaller than it did at the start. It's amazing what a difference a little time with a group of people can make on the impression they have on you. Another thing that I think made dinner so unbelievable was the fact that no one was on their phones because it was Shabbat. We are all so accustomed to multitasking; having conversations and scrolling through Facebook or instagram at the same time. But we forget what it's like to actually look people in the eye and have an uninterrupted conversation with them. The absence of technology definitely made the night a lot more meaningful. 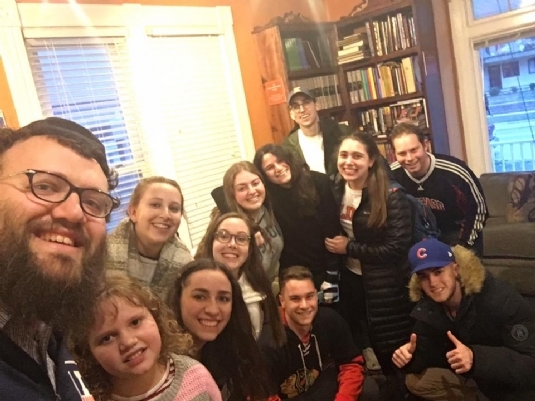 Friday night's Shabbat dinner was one for the books and I know I speak on behalf of the group when I say we are glad it was at the end of the week, after we have already gotten the chance to know each other and make some memories. It made it that much easier to just relax, enjoy the dinner, and make even more memories together. Today, we started our day early and left Berlin around 5am. We arrived at Theresienstadt around 4 hours later and pulled into a rather somber area that looked like a small town. We got off the bus and went Into a building that used to be used as a school. In the building we got to see the actual "movie" that the nazis filmed about the concentration camps to try and fool the world into thinking that the camps were not bad, and even tried to make people think that these camps were a "gift" to the Jews. Also, In this video we got to see the drawings that the people in the camps drew that depicted what they were actually seeing and the real horrors they were going through. When we finished the video, we saw what a bunker might look like during the war and how terrible the living conditions were for the Jewish people. Our tour guide explained that an apartment that might usually hold 1 family, would hold around 5 families during the war. This really struck me, and made me think about how these people were living and how drastically and instantaneously their lives changed. After seeing what their living condions were, the bus took us a little outside the camp to a cemetery and the crematorium. It was extremely difficult to be in the same room where thousands of Jews were burned into ashes. Knowing that cremation goes against the Jewish laws, i felt sorry that these Jews didn't have a choice in the matter. After this, we ended by going to one of the secret synagogues that was still in the town. Being in this room, as someone who is able to practice my religion freely and knowing that so many Jews before me were not able to do so, made me realize just how much strength these individuals had and how much hope they still carried even in the most horrible and darkest of times. The city of Prague and the country of the Czech Republic has shown me that there was much more history and details from the Holocaust than from Germany, the United States, and of course Israel. When I grew up studying the Holocaust in both public school and Hebrew school, it is hard to focus on what happened between the periods after Hitler rose to power, and the final resolution. Today, I learned a fresh perspective on the series of events of the Holocaust, and how one thing led to another. Waking up at 4 am and speeding through the Audubon, we embarked on an unforgettable day to Theresenstadt and Prague. I didn't know much about either places, and the Jewish relevance of each destination. After a three hour drive, we got off the bus at at Theresenstadt to see a very small town square, comparable in size to the University of Illinois' quad. There was a bank, a church, shops, and other things you would see in a small village. But what I didn't realize was that around 100,000 people died within the span of this square. It's crazy to think that many people could die, especially my Jewish people, in such a small area, comparable to the quad in Champaign-Urbana. That really stuck to me. We dug deep into Theresenstadt, heading to the museum, which used to be a former school for Jewish children. We saw a video that the Nazis showed to the Red Cross, a video that showed how great the town was to the Jews, and that they were "so grateful" to be there. We all knew that wasn't true. We also saw the different kinds of beautiful art and music that was made in Theresenstadt. The painting varied from showing the painful current times the people were living, to remembering what freedom was and what it could come to. Following the museum, we saw the first living spaces the Jews lived before it became too overcrowded. But overcrowded was an understatement. In a room the size of a cabin for 10 people in an overnight camp, we saw where the Nazis stuffed hundreds of Jews in the rooms, and the little privacy that drove people mad. However, it only got worse. The next stop we walked to a broke down shack, that had a bunch of junk and garbage in it. It looked absolutely disgusting. Little did we know that after they realized it was too crowded to stuff people in bunk beds, they shoved these people of all ages; kids, people over 65 years old, men, women, into these shacks. I couldn't imagine living in these shacks, especially with the brutal winters they had to face before they died. Following seeing these terrible, terrible things, we went to the worst of all, the crematorium. Remember seeing where the bodies of thousands of people made me so sick to my stomach, gave me the creeps. I couldn't believe the Jewish people who would be forced to put family, friends, and acquaintances into these fire chambers. Following that, we saw where the Jews with the worst jobs at all had to perform "autopsys" of all those who died, and rip their flesh so it would be able to fit in the cremator. The thought of that... there aren't any words. We ended our trip on a much more positive note. We went to a makeshift synagogue the Jews made that was hidden from the Nazis. The size of a tiny attic, we crammed in there to see a painted star, along with the Hebrew words of Jerusalam if i forget you.... It was incredible that even what was going on during the time of death and frustration, they still had faith in G-d and that maybe one day, they could see Israel become a free nation, and most of all, think positive. It was a life lesson to me that no matter what the circumstances are, that we all must think positively and always hope for the best. We finished our trip with prayer and tephillin. I will never forget this experience, and we should all remember the past, and think positive about the future in all our future endeavors of being a Jew. How fortunate we were to have such a profound experience this morning at a Jewish day school in Berlin. As Americans from educationally inclined communities, it is so easy to overlook the fact that many people in this world have to sacrifice for their educations. 15 minutes outside the city, a small group of Jewish-German students study in a school that was once used as a Hitler Youth facility. This was a building that was once laden with swastikas. It once housed a collective hatred for our people. Now, a group of students and teachers have made this once dark place a place of love and learning. The philosophy behind the school, as we learned from the school's Rabbi, is a balance between secular and religious studies. According to him, they work hand in hand. This became evident as we walked from classroom to classroom, meeting students of all ages--from pre-schoolers to 17 year-olds. Some of these students travel from as far as two hours away each day just to afford themselves a quality education. From Torah studies to trigonometry, these students were hard at work. They told us about their upcoming exams and what they like to do in their free time. It was clear that these students were intelligent and committed to their studies. It sheds away any notion that education is obligatory; these students sacrifice for their education. It does not simply fall in their lap. Some students spoke Hebrew and English in addition to their native German, but even for those who did not, language was no barrier. Where we lacked in the ability to communicate verbally, our emotional connection was palpable. We sang and danced in the same language. It should have come as no surprise. After all, we all share the Jewish connection and that alone is enough to sustain a connection that persists through any obstacle. During recess, some of us hopped into an impromptu soccer game. Just feet from the children's' playground was a weather-battered statue of an eagle. It is a symbol of Nazi tyranny. The children do not touch the statue. They do not approach it at all. Rather, it is there as a reminder of what this place once was. It is one of the only remnants from that darker time. But it's necessary to have, as a reminder that we have persisted. Where propaganda posters once hung, there are Hebrew letters and artwork from students. Posters proudly proclaim "Am Yisrael Chai." This is a place of love and acceptance now. There is much work left to do. The building is old and in need of updating. The physical space is small. It is restrictive. The school is forced to turn down some applicants because they are nearing full capacity. But despite all of this, there is no pity. There is only optimism. They are a family. And today, they welcomed us in as part of their family. It was extremely humbling, almost to the point where it brought tears to some of our eyes. After today, it is certain that the Jewish future is bright. There is only growth from here. Today we went to the Weisensee Cemetery in Berlin to clean up a portion of it that hadn't been touched prior to the Winter. We were fortunate to be given the portion of the Weisensee Cemetery dedicated to the fallen Jewish soldiers of World War I. These soldiers had no one to come visit them so in honor of their service, we out in a few hours of work to beautify their resting places. We learned this morning that the greatest acts of kindness one can perform are those where there is no reward for the doer. The soldiers evidently had no way of thanking or rewarding us for the time we put in today, but Rabbi Dovid told us that they would still be quite thankful. It was an emotional experience but incredibly rewarding as well. I hope to continue to honor the Jewish people of Berlin in any way possible as this trip continues. Touring around the main streets of Berlin has changed the way as I see myself as a Jew. Walking through the main squares, Pariser Platz, Checkpoint Charlie and many more, I wore my chi necklace, along with my Illini Chabad keepah (something of which I rarely do in the States) head up and smiling. Today I feel that pride of being a Jew. I reflected both upon not just the past, but the present and the future of the Jewish people. This afternoon we visited the U.S embassy, neighboring Brandenburg Gate . We met with the US Ambassador, and he was very open to talking to us. I asked him about how he handles Jewish culture and antisemtism in both the U.S. and Germany. He gave a great response, as far as listing statistics of the decrease of antisemetic acts in Berlin, and how they are counteracting them and finding new ways to educate the younger generation of not only the past, but the future. I felt proud to be an American sitting in that room. Following our meeting with the U.S. Ambassador, we had a tour guide lead us through the center of Berlin. Some highlights included Reichstag, the gypsy memorial from the Holocaust, and the Berlin Wall. But what really stuck out to me was the Jewish Memorial in the center of Berlin. Known as the biggest plaza in Berlin, we walked through the Jewish memorial, a memorial that is up for interpretation as there isn't a definition of Holocaust throughout the plaza, just different lengths of stone. Walking through the streets of Berlin, our tour guide stopped us in the middle of a parking lot, and began to discuss at that very spot, Hitler was hiding under a bunker near the end of World War II and committed suicide. We stopped there, reflected about what happened, and then began to wrap tephillin and dance, an act unimaginable 75 years ago. It really was a sign of victory for the Jewish people. Being in the place where it all happened, learning about the history of the country, and looking to see how far we've come has come full circle for me as a Jew. I learned that we must not only reflect about the past, but to also look forward and celebrate the way society has changed in the past century. It is an unbelievable feeling being a Jew in this city, and I'm very fortunate that Rabbi Dovid has given me this experience. Keep checkingthis blog for posts and thoughts as the trip comes along.